Learn at your own pace. Practice, watch, learn, inquire, accomplish! Participate and earn transcripts,certificates, and achievement badges throughout. Easily access from the comfort of your home while waiting in line at the market. Ready to Learn for FREE? Let’s Begin. No setup. No hassle. Just learning. 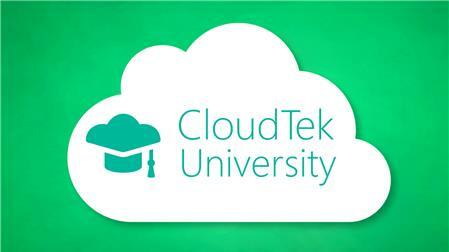 CloudTek University is a unique platform that marries “Just-in-Time” professional cloud computing education with contemporary and relevant insight and information. This blend is critical to enabling the balanced and informed viewpoint needed for cutting through all the cloud computing hype. Our videos, blogs, social media feeds and training tracks serve as your professional resource, reference and trusted advisor. While most of our client opt for a 6-month or annual subscription, our free or paid services will keep you informed and well positioned to lead and succeed in today’s cloud focused environment. Please check out our free trial (No credit card required on sign-up) and give us the pleasure of partnering with you. Supercharge your learning with access to unlimited courses, classes, tools, and resources. Interact and learn from world class instructors and subject matter experts. Chat with your peers and engage in conversation with your instructors.